There are far fewer Harley Davidson Tri-Glides on the road as there are Softail, Dyna, & two wheel FLH/FLT models. 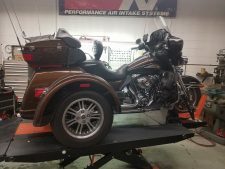 It is not frequent that we have trikes roll In The Shop for something other than basic maintenance or repair. 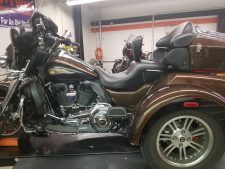 That’s why, we were excited to have the opportunity to install Legend’s Tri-Glide rear lift kit along with Legend’s Revo-A shocks on this 2013 HD Trike. 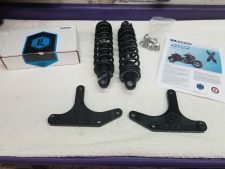 The lift kit is comprised of only 2 lower shock mount brackets. There is one left and one right side bracket that simply replace the stock lower brackets but we will get almost 2 inches of lift. The new shocks are an excellent alternative to the factory shocks. They are not part of the lift kit. The stock, factory shocks also work with the lift kit. The installation procedure is relatively straightforward, but we highly recommend having a factory service manual on hand. Especially for safely lowering the axle and not losing any related orientation in the area. It is ideal to have two flat jacks available. One jack will be used for lifting the rear end of the motorcycle and the other jack to raise or lower the rear axle. Start by securing and jacking the Trike so that the rear wheels are raised and remove the rear wheels. 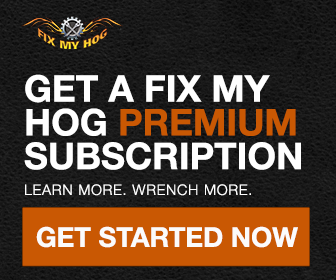 Now, support the rear axle and remove the factory shocks and lower mounting brackets. Don’t forget to release the factory air line from the top of the shock. Now, you will be able to slowly lower the rear axle into position. Or you can lift the rear end of the Trike to accomplish the same. We found it easiest to mount the shocks at the top first. Then, install the Legend lower shock mounts, and finally secure the bottom of the shocks to the lower brackets. Legend instructions suggest the use of blue Loctite on all bracket and shock hardware. It is if upmost importance that all hardware is evenly tightened and torqued to factory specs. The job is complete after reinstalling the rear wheels and torquing the lug nuts. Check out our before & after pictures.